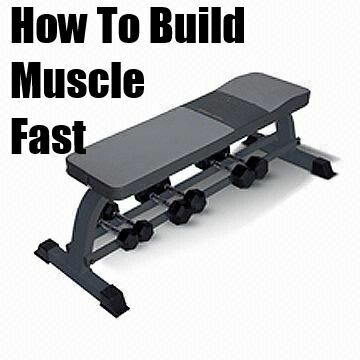 Finding out how to build body and increase muscle mass is simple. It really comes down to two things: working out, and giving your body the right fuel. Obviously, body builders have to train. There is no shortcut here, although of course there are ways to increase the effectiveness of the training that you do. The first of these ways is to make sure that you have an efficient bodybuilding workout routine. This means deciding which exercises you will do on which days. It is vital to plan this because each muscle needs at least one full day recovery time between workouts. The workout breaks down the muscle and the recovery time is when it builds up again, stronger than before. That’s why more training is not necessarily better. To build muscle size rather than strength, aim for sets of around 10 reps with a short rest of around 1 minute between sets. The importance of good form cannot be over emphasized. You must learn to do each exercise correctly in the beginning when you are learning how to build body and have somebody check your form from time to time too. A qualified trainer is best. If you must learn from a video, at least have a buddy there to watch that you are doing everything correctly. You cannot work out and look in the mirror at the same time. You need to push your muscles to fatigue, so that they are stressed enough to trigger the muscle building during recovery time. However, you should never exercise beyond the point where you have good form. Your last rep should be the last one that you can do with perfect form. If you get tired sooner, reduce the ; if you could have done several more, increase it. It helps to have a buddy to act as spotter when you are figuring this out, especially on a bench press. They can help you with the and avoid accidents if you find you have lifted one rep too far. When you want to build muscle rather than fat it is vital to have the right food. Avoid junk and sugary foods and concentrate on proteins and complex carbohydrates. Drink plenty of water through the day. Cut down on alcohol. Proteins include meat and dairy but also beans, nuts and seeds. There is even some protein in vegetables. Complex carbohydrates are whole grain carbs such as brown rice, whole grain bread, oatmeal, corn etc, plus fruit and starchy vegetables like potatoes and carrots. Most bodybuilders add whey protein, creatine or other supplements to their diets. Remember that these are not intended to replace a healthy diet, only to supplement it. During your workout, choose a sports drink that includes protein as well as carbs. This is the best combination for reducing muscle damage plus fast muscle building and recovery. Follow this with a high carb drink or snack within a half hour after your workout, to stimulate glycogen production. Eat often and eat smaller meals to keep your body’s supply of fuel steady and even. Figure out some healthy snacks. When it comes to learning how to build body and muscle mass, it is much better to have 5-6 small meals than 2-3 large ones.